Are you ready for some epic “Would You Rather?” challenges?! We are all obsessed with Disney Channel’s brand new show, Coop and Cami: Ask The World and we always look forward to seeing what kind of fun adventures and hilarious challenges Coop, Cami and their younger brother, Ollie get into. Starring in the show as Ollie Wrather is the spectacular Paxton Booth. It’s clear to see that the incredible Paxton Booth was destined to make it big in the entertainment world. He can portray any character so effortlessly and he exhibits his brilliant, acting talent in such a magnificent way. At such a young age, Paxton Booth has already accomplished so much and there’s only many more achievements in store for this excellent actor. Paxton Booth is such a great pleasure to watch on our TV screens. He always brings his positive personality and his great energy to everything that he does – whether it’s working on his awesome Disney Channel show or walking the red carpet. Paxton Booth truly deserves all of his success and we can’t wait to see what kind of excitement his character will get into in future episodes of Coop and Cami: Ask The World. 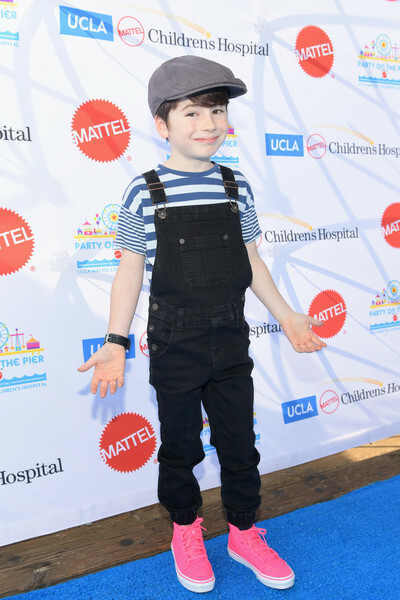 I, Alexisjoyvipaccess had a terrific time covering the 2018 UCLA Mattel Children’s Hospital Party on the Pier and had an excellent time interviewing the fantastic Paxton Booth at the event. Paxton Booth dished exclusively to Alexisjoyvipaccess all about what is a memory that sticks out to him the most from working on Coop and Cami: Ask The World, what it was like for him doing his Disney Channel wand ID and so much more only in our VIPAccessEXCLUSIVE interview. Paxton Booth even revealed which Disney Channel show he would like to see Coop and Cami: Ask The World have a cross-over episode with – hear what he had to say in our VIPAccessEXCLUSIVE interview below. Thanks for the great interview, Paxton! Check out my VIPAccessEXCLUSIVE interview with the remarkable Paxton Booth at the 2018 UCLA Mattel Children’s Hospital Party on the Pier below! Previous VIPAccessEXCLUSIVE: Fashion Icon Rachel Zoe Interview With Alexisjoyvipaccess At The 2018 UCLA Mattel Children’s Hospital Party On The Pier! Next VIPAccessEXCLUSIVE: Merit Leighton Interview With Alexisjoyvipaccess At The 2018 UCLA Mattel Children’s Hospital Party On The Pier!